We all have some degree of clutter in our lives. Some of us have red-zone, Def-Con 5 degrees of clutter in our life. You know what I’m talking about, right? The clutter of stuff that wallows around in our lives left unresolved or worse, continually hidden. Yesterday’s BLOG was focused on CHATTER and how dangerous it is to allow chatter to remain in our life and leadership. Today, it’s CLUTTER. Here are five ways that clutter can place a WWE stranglehold on your life and how to avoid them. Clutter can be found in our unresolved relationships. Clutter lirks around in bitterness, anger, unforgiveness, and pettiness. It hangs on to hurts and frustrations that inevitably eat away the soul of the Cluttered soul. The Cure? FORGIVENESS. Get your season of forgiveness started and you are already less cluttered. Clutter can be found in people that you used for personal gain, not gifts from God to encourage and sharpen both you and them. The Cure? Take a deep dive check-up of your motivations. If you’ve been treating people for what they can do for you or gain from you, clear the deck and “fess up.” I’ve done it and it’s therapeutic. I also think the Scriptures are clear on this. Make the “one another verses” come alive in your soul and you will come alive in meaningful relationships. Clutter can be found in the belief that you are the only person that can do things right in your family, team, band or office. If you are “that person,” take a good look in the mirror. Your ego will be seen in technicolor. You don’t have to answer the problems or match the stories with a story even bettr…all the time. 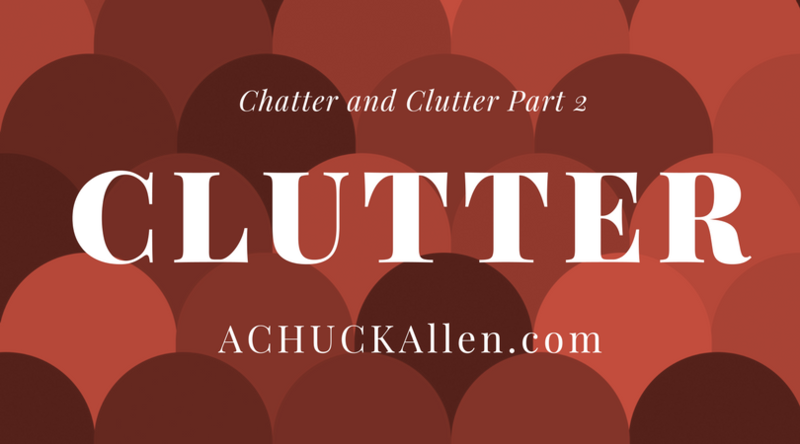 Clutter can be found in chasing peace, joy, happiness, and contentment in more stuff. bigger houses, cooler cars or that Sea-Ray boat. I can promise you that this is a fact. If you aren’t happy and content now, you’be less content and far less happy once you realize that you cannot win the space race to all things that have a price tag on them. The Cure, Ask yourself if the next desired “thing” is good for a very brief season. Clutter can be found in the attitude of hanging on to what you have. It’s the thought that it’s mine and what’s mine is not yours. The Cure? Realize that you are simply a steward of all you have and that living life with an open hand will actually take you and keep you in a contented life filled with joy. Get rid of life’s clutter and take on the life of gratitude and peace. One year from now, you’ll be so grateful that you did this. The Apostle Paul said that he had learned to be content with little or with much. He knew what he was talking about. External efforts always yield short-term benefits. Internal efforts always yield long-term eternal rewards.